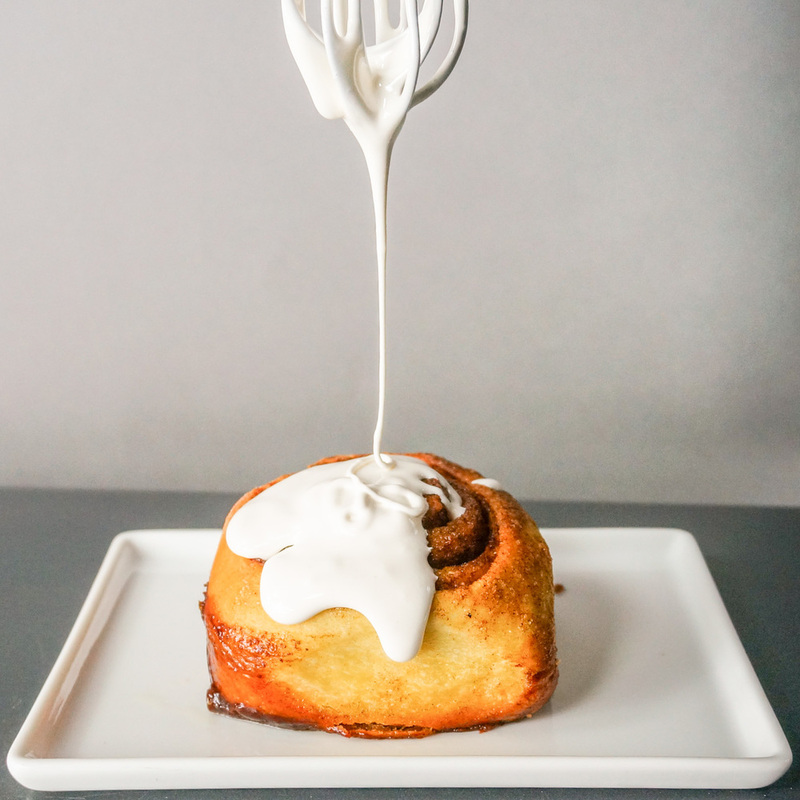 I implore you, do not make these cinnamon buns. Once made, your family will force you to make them every single week. They're a little too easy to make and far too easy to eat. I love cinnamon buns as much as the next American, but they're too doughy in my opinion. And the bun itself never has any flavor, it just gets covered up by cinnamon and then doused in sugar. I fix this by using Ensaimadas as the bun. A heftier, milky, more buttery dough, Ensaimadas are yeast-risen breakfast buns from Mallorca and The Philippines. They taste milky and rich, with a tender and fluffy texture you'll never get from a regular cinnamon bun. I encourage you to re-roll your scraps and bake them off as plain sugar buns (spread with butter and brown sugar, roll, slice, and bake on a baking sheet) — you'll be delighted with the taste and texture, and have something to snack on until the buns are done. And then there's the glaze, normally cloying, flat, and boring. Not so with this marshmallow glaze. It has that candy flavor and retains the ooey-gooey mouthfeel, which contrasts the cinnamon very nicely. As a plus, it doesn't run when heated. If you're baking these for the morning, there is a point at which you can just hold them in the fridge and then throw them right in the oven in the morning. Yields 8 buns, good luck keeping them. Pour some very hot water in a small bowl to warm it while you get the real water ready. It's very important that the ⅓ cup water not exceed 95°F or the yeast will be killed. When you have the temperature right, pour out the water in the bowl, pour in the ⅓ cup water, add the yeast, and sugar. Stir lightly and set aside to bloom. It should develop a thick head of foam and smell intensely. 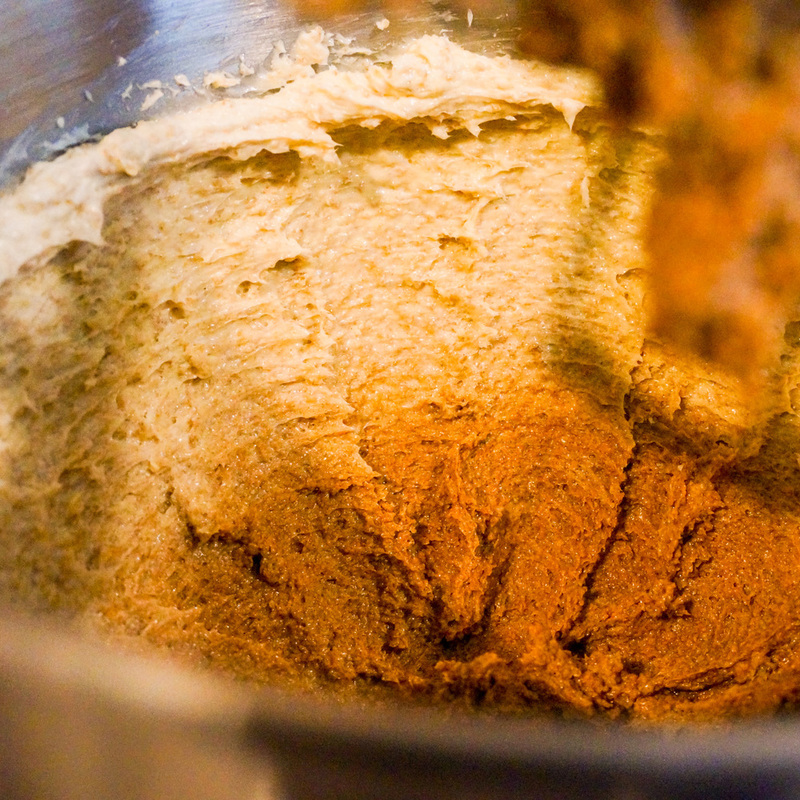 While the yeast is blooming, combine the flour and brown sugar in a stand mixer fitted with the dough hook attachment. Mix for a minute. Add the bloomed yeast, evaporated milk, and vanilla extract. Mix on medium-low until well mixed. Reduce speed to low and slowly pour in the ⅓ cup melted butter. The dough will become slippery and seem like it won't incorporate the butter, but give it time. Don't increase the speed until it's back to combined dough or butter will fly out of the bowl. Knead for 10 minutes, it should be slightly sticky but elastic and fairly firm. Spray a large bowl lightly with cooking spray and scrape the dough into it. Cover with a damp towel and set into a warm place to proof for two hours. It should double in volume. 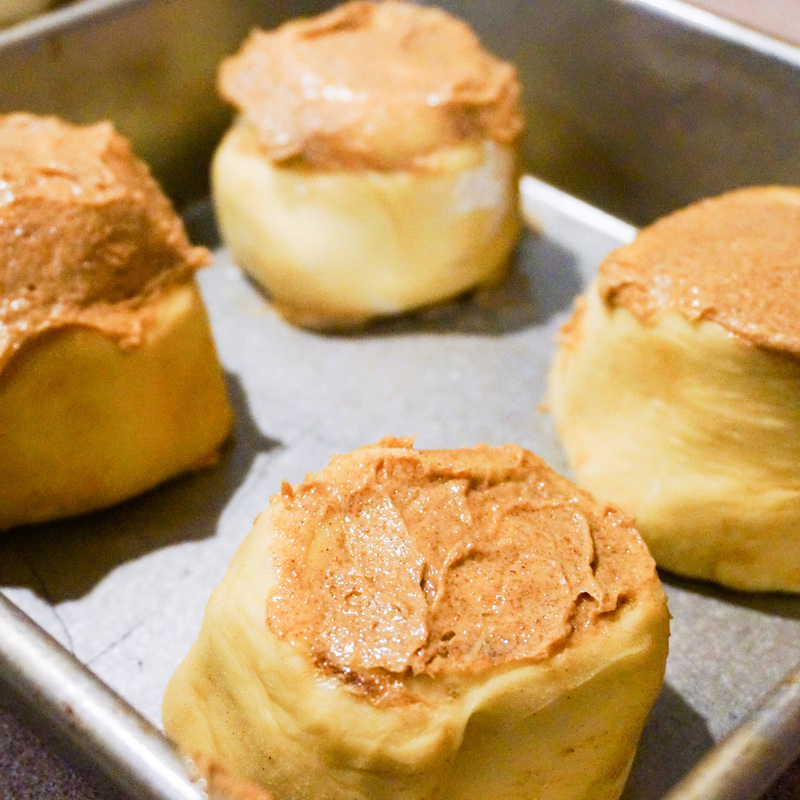 While the dough is proofing, combine the 1 cup softened butter, ¾ cup brown sugar, and 1 tablespoon cinnamon. Set aside. After two hours, dust a work surface generously with flour, and flour a rolling pin. Turn the dough out and roll out from the center into a rectangle a little larger than 13 inches by 20 inches. Using a ruler or bench scraper (most are 6 inches long), measure out precisely 13 inches by 20 inches and cut the rectangle out as straight and evenly as you can. Save and re-roll the scraps as sugar buns (roll into another rectangle, spread with butter and sugar, and bake separately). Spread ¾ of the softened butter mixture over the entire rectangle, right up to the edges. Take care to spread it evenly and thinly. Sprinkle the remaining 1 tablespoon cinnamon evenly over the rectangle — a sifter helps. 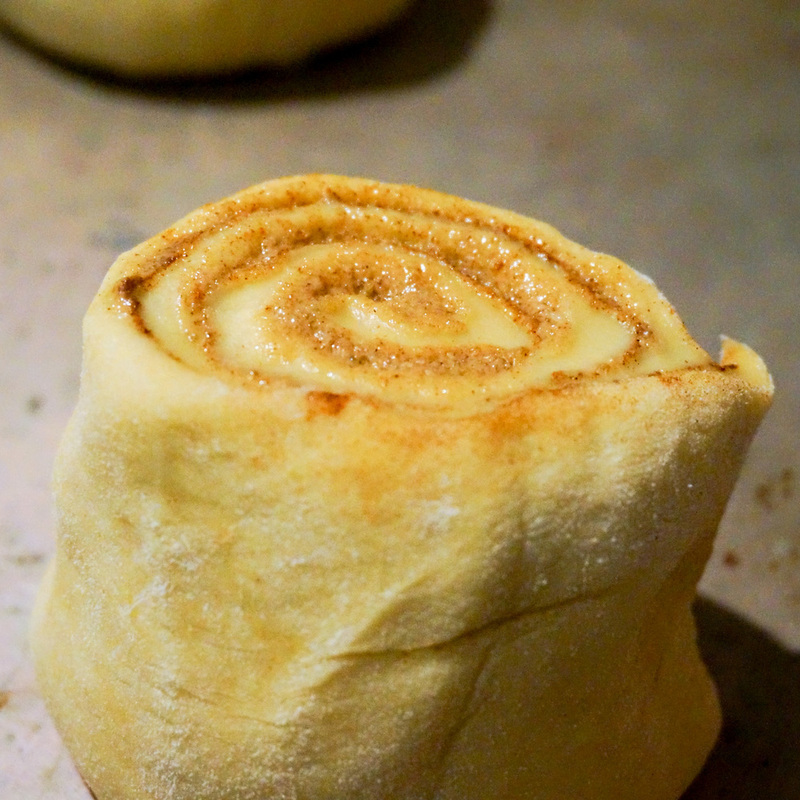 Roll the dough lengthwise tightly to get as tight of a spiral as you can. Try not to push down on the dough, just pull it across. The ends will have rolled unevenly. You can either cut them off or leave them and press those pieces into the pan to flatten. Staring from the center, slice the dough into half. Then slice each half into quarters, and each quarter into eighths. Spray the baking dish(es) with cooking spray, and arrange each bun such that they're at least an inch away from the sides of the dish and evenly spaced away from each other. They will spread greatly in the oven, and you want them to touch to get the classic shape. Dot each bun with a pat of the remaining softened butter mixture. If planning to bake the buns as soon as possible, let proof for 30 minutes, then chill another 30 minutes. If planning to bake the next day, cover loosely with plastic wrap and refrigerate overnight. Preheat an oven to 350°F. Combine the ingredients for the marshmallow glaze in a bowl. Once preheated, put the buns into the oven straight from the fridge. Bake for 30-35 minutes, until evenly browned and done in the center. Erring on the side of cooking longer won't affect this dough much. While the buns are baking, whisk together all the ingredients for the marshmallow glaze. Let buns cool in the pan until they can be handled. Drizzle over as much glaze as you like, and enjoy piping hot. To reheat, microwave on high for 20 seconds (the glaze will not run).